With Iranian-American nuclear relations back on the front burner — make that front and center — I was able to secure a visa and travel counter-clockwise by train around Iran, covering more than a thousand miles. In American headlines and Congressional outbursts, Iran is thought only to be grappling with its nuclear dilemma. But I came to the conclusion that Iran’s future is tied more closely to its cities, where some 60 percent of the population lives, than it is to its nuclear capabilities or its revolutionary doctrines. Tehran: I flew into and out of Tehran, the city that dominates the life of Iran. Even at 3:00 AM the traffic was heavy, and when I went around on the metro, there was never a moment when I wasn’t as squeezed as canned caviar. For a city of never-ending tenements (similar to Queens or Brooklyn), Tehran remains comparatively calm. I never heard shouting, car horns, or confrontations, just as I never saw an armed police officer (except at the airports) or Revolutionary Guard. Omnipresent portraits of ayatollahs Khomeini and Khamenei are the only symbols of sidewalk politics. Diplomats and wealthier Iranians prefer to remain crowded into North Tehran, which feels like an alpine village, given the snowcapped peaks that soar in the background. This is where the last two Shahs had their palaces (which are now open as museums of imperialist decadence). The poor live in the desert flatlands to the south. I walked outside the embassy complex where in 1979 the American diplomats were held hostage; its twenty-seven acres looks like an 1850s textile mill in Pawtucket. For reasons few can explain, Tehran works well as a city. The subway trains — while packed — come and go on schedule. The bazaar is a mall of plenty, even with all the sanctions; the university attracts the best students (including my gifted guide), and even the dense traffic seems to move. Tehran may lack architectural grace, central focus, cozy neighborhoods, restaurants (I saw few), tea gardens, and sufficient parks. But it doesn't feel as if it is on the edge of a fundamentalist abyss, as it's portrayed in the Western press. It struck me more as an endless block party. Mashad: Iran’s most holy city. With a population of three million, Mashad is holy because it is where the remains of the Eighth Imam (Reza) are entombed. Pilgrims from all over Iran and Iraq come to the shrine, which is at the center of a large complex of mosques, museums, minarets, and open courtyards. Before the 1979 revolution, Mashad had an old-city feel, with the shrine at the core of narrow twisting lanes and alleys. Now the shrine is at the center of an open, polished-marble mall that would be a skateboarder’s dream, were dudes ever called to prayers. What surprised me is how welcoming the shrine is to non-believers. I came and went from the courtyard at all hours. Inside the shrine, I was free to sit on the Persian carpets, take pictures, read my book, or check my iPhone. Who knew that Iran’s holiest site doubles as a vibrant city park? Esfahan: Iran’s cultural capital. I rented a bicycle to get around this city of seventeenth-century splendor that fans out from the vast Naqsh-e Jahān Square (think of an enormous college quadrangle). In one direction are the warrens of the grand bazaar, while off at other angles there are palaces, mosques, and the incomparable mosaic dome of the Sheikh Lotfollah mosque (the inside of a Swiss watch, done in turquoise comes to mind). I was reminded of Florence (the good and bad), sensing that someday, when Iran has rejoined the travelers’ universe, bus tours will overrun the delicate Renaissance balance of the city center. The new city of Esfahan is bland by comparison to the old town and the bazaar. It stretches into the desert on the other side of the Zayandeh River, arched by an iconic bridge. There is also an old Armenian Quarter, which testifies, if on a small scale, that Iran is a polyglot mix of Persians (51 percent), Azeris (24 percent), Gilakis and Mazandaranis (8 percent), Kurds (7 percent), and Arabs (3 percent). Yazd: Southeast of Esfahan, in the center of Iran; an oasis of sorts. Come the restoration, Yazd — a city of mud-colored palaces and soaring minarets — will become the end of the rainbow for Persian Empire tourists, complete with five-star boutique hotels set around interior pools (there are some already) and rooftop gardens that serve tea at sunset and deliciously warm bread for breakfast. Shiraz: Near the ruins of Persepolis, the Persian showcase city in the desert. After the intensity of Tehran and Mashad, Shiraz came as a relief, with its palm trees, wide sidewalks, cool interiors, laid-back atmosphere, and many places in the shade to drink bottled water. Travelers come much as they used to pay homage to local vineyards that gave the world (but no longer Iran) Shiraz wines. Traffic is detoured from the city center, although on the edges it has the confusion associated with American cities in which interstates blaze their way through downtowns. Only the car speaks to most Iranians. While I loved my trains, they were largely for school kids on excursions and pilgrims on the move. VIP buses are for intercity connections. For the rest, there are cars, a gamut from clunkers to new SUVs that run on $1-a-gallon gasoline. Qom: The city of mullahs. South of Tehran by about 100 miles, and not far from the new Imam Khomeini International Airport, which was built to serve both cities. The clerics who control Iran from behind veils of secrecy live in Qom, which is — so to speak — the Vatican City of Iran. Ayatollah Khomeini lived here for much of his life, although later the Shah had him deported. Qom surprised me with its Disney-esque qualities. I had expected mullahs ready to flagellate themselves, or perhaps angry crowds of the faithful eager to demonstrate their spiritual purity to the ayatollahs. Instead, it brought to mind what might be thought of as Allah’s Asbury Park, complete with blinking lights, souvenir stands, food stalls, cruising teenagers, and a summer holiday atmosphere. Even inside the shrine I watched mullahs checking their iPhones and small boys playing tag. When, at sunset one evening, my train stopped at a station for evening prayers, only a few passengers went into the platform mosque. The rest, it seemed, bought chewing gum. Matthew Stevenson, a contributing editor of Harper’s Magazine, is the author of, among other books, Remembering the Twentieth Century Limited and Whistle-Stopping America. He has just returned from Iran, and lives in Switzerland. 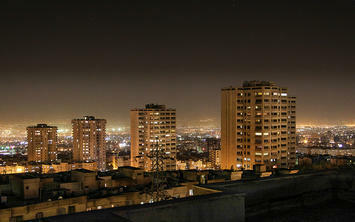 Flickr photo of Tehran at night by Loizeau.